Up until now it was quite difficult to get your hands on a proper installation disc or USB flash drive to install Windows 8.1 on a PC. While you can buy a Windows 8.1 DVD, you don't get media if you upgrade Windows 8 to Windows 8.1 for example. If you then decide to format the system and start anew or move everything to a new PC, you may have noticed that you need to install Windows 8 first to update it to Windows 8.1. Downloading media can also be useful if you cannot install Windows 8.1 from Windows Store for whatever reason or don't want to perform that operation for multiple systems that you want to update. Workarounds have been available for some time to create Windows 8.1 installation media to avoid going through this lengthy installation process but they too required you to go through a lengthy process. 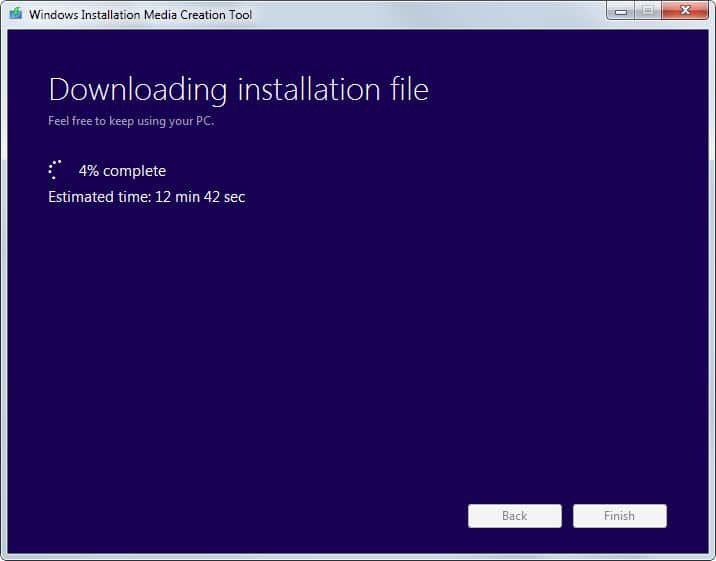 Microsoft is now making available a Media Creation Tool which you can use to create Windows 8.1 installation media right away. After you have downloaded the program from the official website and started it, you are asked to select the language, edition and architecture. All languages seem to be supported. As far as editions are concerned, you get Windows 8.1 and Windows 8.1 Pro, the N versions of both operating systems, and a single language Windows 8.1 version. N editions of Windows 8.1 don't include any media related technologies such as windows Media Player or Skype. A click on next displays the available save options. You can save the installation files to a USB drive right away provided that it offers at least 4 Gigabyte of space or create an ISO file instead which you need to burn to DVD then. 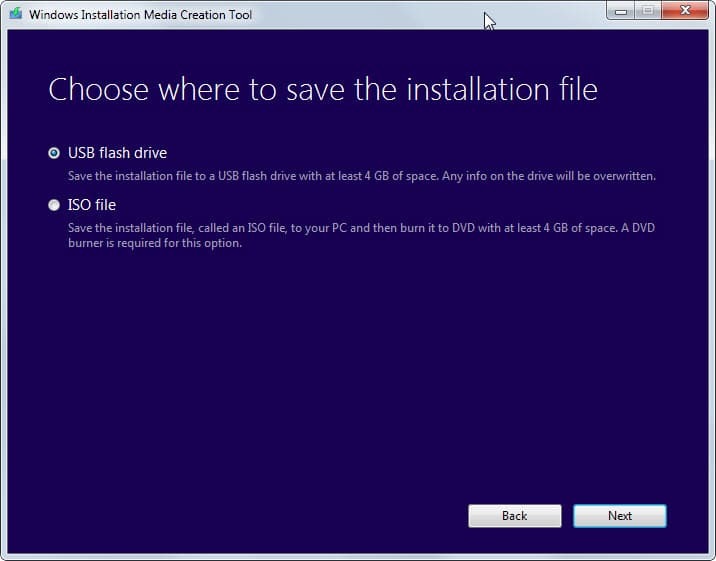 You are then asked to select the USB Flash Drive you want to copy the Windows 8.1 installations files to or a save location for the ISO file. The program displays the download progress in its interface then and estimates the remaining time until the operation completes. The USB Flash Drive can be used right away while it is necessary to burn the ISO image to a DVD first. It took a while for Microsoft to provide Windows customers with an option to download a Windows 8.1 ISO image from an official source. 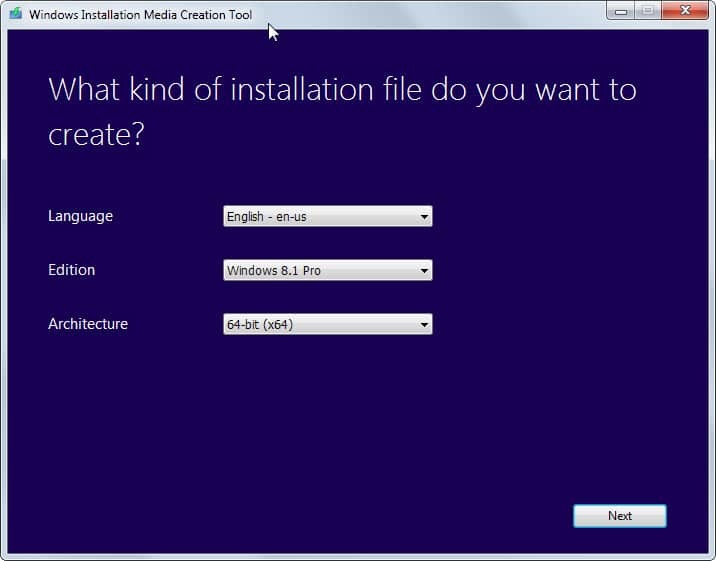 The release of the Media Creation Tool provides all users with the option to create ISO images of Windows 8.1 or copy the installation files to a Flash Drive instead. Thanks for posting this. This computer didn’t come with Windows 8.1 installation disks. I was hoping someone would come up with an easy way to make them. Do you have to have a Windows 8.1 key to use this installation media or will the Windows 8 key work? According to the description, you need to enter a Windows 8 or Windows 8.1 product key if you are running Windows 7. I’m not sure how this is handled if you install on a new system without previous operating system though. If you try it out let me know please. Would like to know the answer to this as well. Previously I have carried out a fresh install of Win 8.1 using the workarounds described by yourself whereby a 8.1 key was needed for the install, but your Win 8 key was actually needed to activate. This has worked fine but this way would be a more elegant solution if you could just use your Win 8 key, not that I am planning to re-install again any time soon. Does this work if you want to make a fresh reinstall of Win 8.1 on the same PC which already had 8.1? In that case, do you need to enter the key or is the process automatic? Thanks for this information :). In the method covered earlier, product key was required to be entered. However, the product key won’t work for OEM versions. That sucked because I have an OEM version. Do you know if this official tool will accept OEM keys? Well, I will download the ISO anyways, and keep with me. Update from my side, and it should help others too with similar questions. I was able to install Windows 8.1 using this disc, and it accepted the OEM key that I had, without any issues. That’s really a relief. Also, it is a full installation disc, which means that it will install Windows 8.1 on the system. I had the query in mind, whether it is a full installation disc, or just an ISO for only the Windows 8.1 update to install on a Windows 8 system. I did not like one thing though. With my original Windows 8 CD, it was possible to create a local account, but not with this disc. There was no option to create local account. Had to sign in with my Hotmail account, without which the installation will not proceed. Thanks Martin for this article, and the quick updates that you post. Question for Anupam or anyone else that can answer. How did you go about getting your OEM key. I have a Lenovo laptop and there is no sticker on the laptop case, like there used to be in the pre-Windows 8 days. My understanding is that the key is embedded in the BIOS. But for the life of me, I can’t figure out how to get my key. Cannot see a Reply button to reply to BobbyJ, so have to post here, as a reply to my comment. Hope that BobbyJ sees this. BobbyJ, I had bought an OEM Windows 8 disc from Amazon. So, that’s how I have the OEM key. Since you have a laptop that came with Windows 8, then yes, the key must be in BIOS. There are a number of ways on how to get that key. I am posting some links for that. Hope that one of the method works for you. The above link posts about few small software that will reveal the key. I tried this tool under Windows 7 and didn’t ask for Windows 8.1 key.Just select language,version,architecture and the program does the rest.It downloads the esd file(creates an ESD folder on the root of C:\ )decrypts it,makes a iso out of it(if you pick the iso and not the usb option). That’s great news. Thanks for verifying this. Thanks for verifying this! If it accepts any Windows 8/8.1 key, that would be just great! If only Micro$oft made this tool available right from the start!!! My gosh! What a great find-tool. I skip the Win 8.1 thing, hope 10 cleans the problems introduced in 8.x. This might depend on various reasons. Tipycally, you’d have to install the appropriate driver for your graphics card, for example. Ot, you would need to adjust the screen settings directly in Windows as appropriate. Tony. Have a look on the side or back of your computer there may be a 25 digit number there it is in sets of five if ther is try that as your activation key it may work for you. Sorry I have an upgraded Windows 7 computer so I would’nt know about later models, appologies. I had a problem with Desktop icon size (not after install, just normal misuse! ), the solution was simple. Hold down CTRL key and use mouse scroll wheel whilst on the Desktop. Microsoft Support confirmed to me that if you bought a PC with Windows 8/8.1, then this tool will automatically retrive your Product Key from the machine UEFI (BIOS) when you run the installation media. You won’t be asked to enter any Product Key manually. A few people I know tried this and it worked fine. But Did Micosoft tell you that they WILL NOT let an XP user (I know, it’s unsafe but I don’t use this machine except in an emergency!) on their Create Installation Media page so that user can Bail Out my Dead MalWare Infested 8.1 Machine somehow??? WONDER if STEALTH Browser Mode would work instead? Your thoughts? Good question roboxp! I would be interested in that answer as well.